The project consists of two houses located in a trapezoidal shaped backland site bounded on all sides by Victorian terraced houses. The constraints and challenges were considerable and dealing with no fewer than twenty-three neighbours and associated party wall agreements. This was the first independent project for this firm of young architects and developers. The plan uses an abstraction of the site geometry to create a triangular/trapezoidal forms for the two houses. 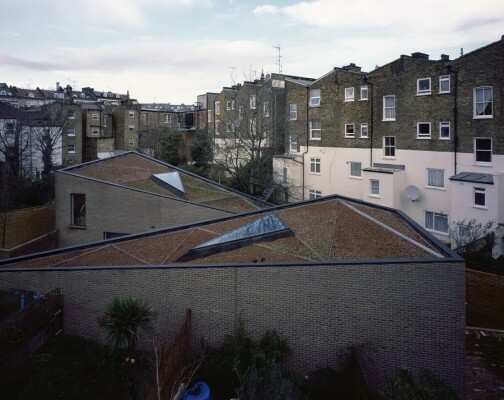 The houses are separated by centrally located triangular entrance courtyard. On first sight the tightly tapering entrance court yard appears uncomfortable, however the use of a door near to the end of the courtyard allows an opening out into the entrance of the one of the houses; this entrance sequence is very satisfying. The motif of the triangle is repeated throughout the project and this obsessional playfulness gives the houses a ‘folly’ like joy. This playfulness does not detract from a clear and well-resolved spatial hierarchy of the houses. The houses are essentially large volumes that are inhabited by mezzanine floors benefiting from generous and spacious primary spaces that are in direct contrast with the modest scale of the houses. 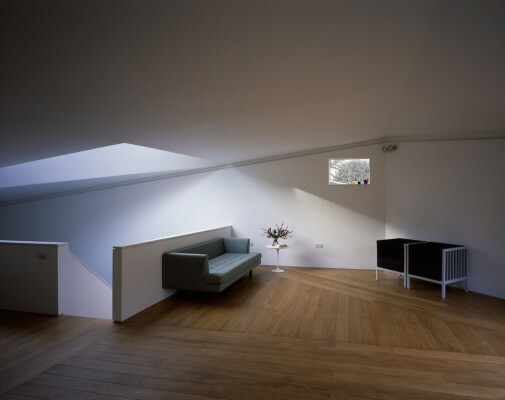 Both homes have a beautiful sense of light, and remarkably engage with the outside with discreet views to the garden. 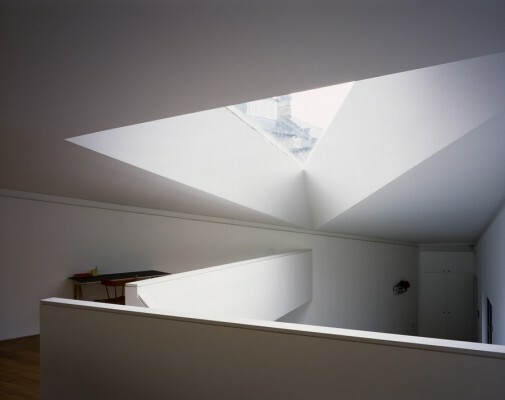 Where views through vertical surfaces are not possible the architects have inserted triangular skylights. There is a wonderful obsession with the triangle throughout this project from the plan, to the landscaping all the way through to the floor and wall finishes, this is fun and quirky and entirely appropriate. The detailing is well conceived and resolved and has been constructed to a high standard. This project balances a sense of fun with rigorous attention to detail. The architects have created their own project that is a testament to their ingenuity, determination, skill and bravery; this combination has delivered two very liveable, spatially complex, quirky and joyful homes.